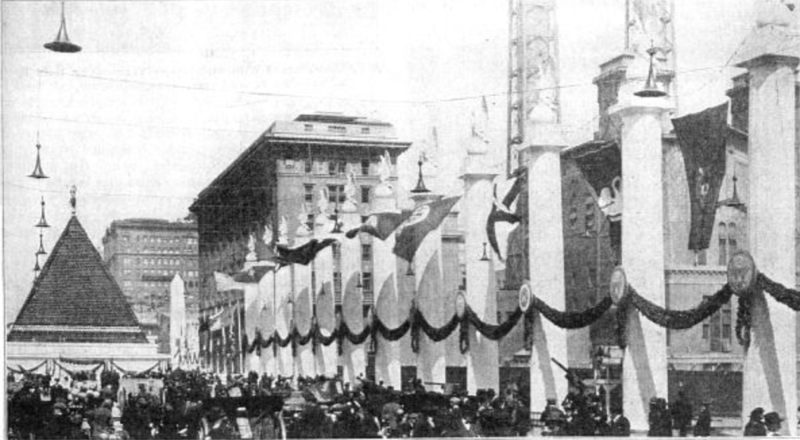 The picture above was made in 1919 during the Victory Liberty Loan and the lamp-like objects hanging above the crowd are so-called loud-speaking telephone receivers. The crowd had “the unusual sensation of having spoken messages come to them out of the air” (source: Electrical Review, May 31, 1919). These 112 loud-speaking telephone receivers with large horns—in other words, loudspeakers—amplified the speeches of the event and made it audible to the crowd of approximately 10,000 people (my experience with numbers in these kinds of descriptions is that they might be exaggerated, but in the pictures, the crowd seems at least quite large). One of the loud-speaking telephone receivers used in what was called then a “Public Address Telephone System” (picture source). 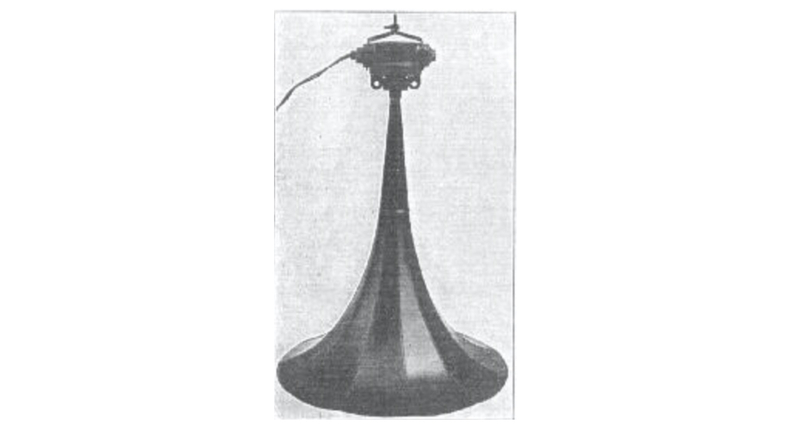 This early use of outside sound amplification through loudspeakers is mentioned on the website www.medienstimmen.de. This site focuses on early sound reinforcement systems and was initiated by Ralf Gerhard Ehlert. It was a very valuable resource for obtaining information during my research on early microphone and loudspeaker technology. For that reason, I would like to dedicate a post to this website, since it might be helpful and inspiring for others, too. 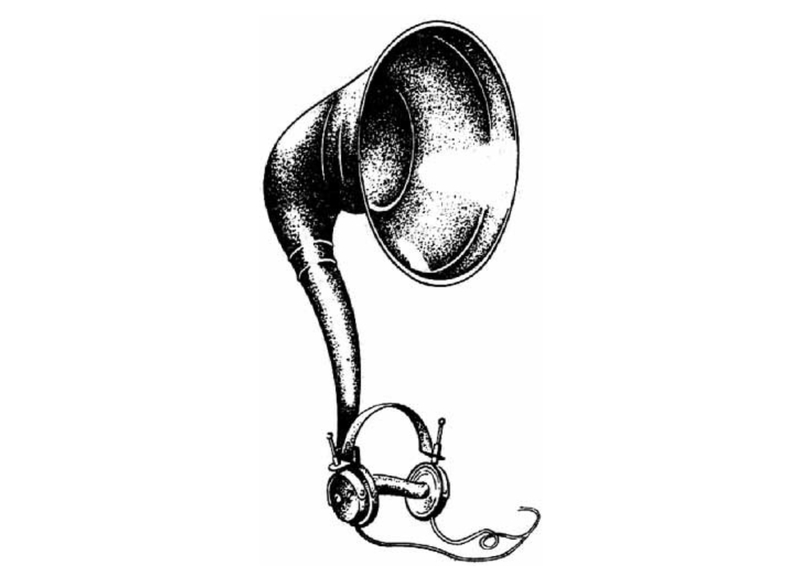 Ralf developed this website as part of a research project on the use of sound reinforcement systems for crowds during the first half of the twentieth century. A special focus was on the use of microphones and loudspeakers during National Sozialism (1933-1945), since the development of early sound reinforcement systems for crowds unfortunately is strongly related to this. Most of the articles are in German, but many links point to English sources and I think the lists are also very understandable without any German knowledge. A Telefunken Lautsprecher (1925) for the Vox-Maschinen A.G. in Berlin combined headphones with a horn (picture source). 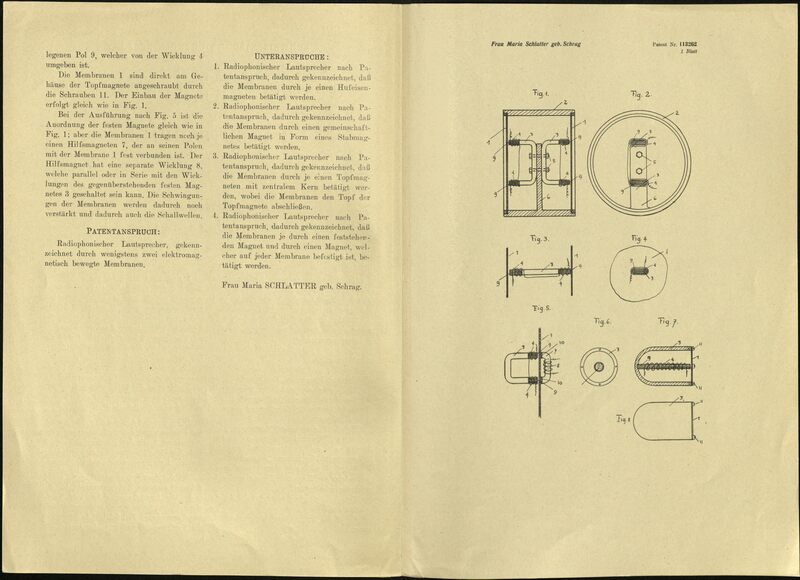 The Schallwand (loudspeaker wall) invented by Peter Grassmann in 1936 (picture source). 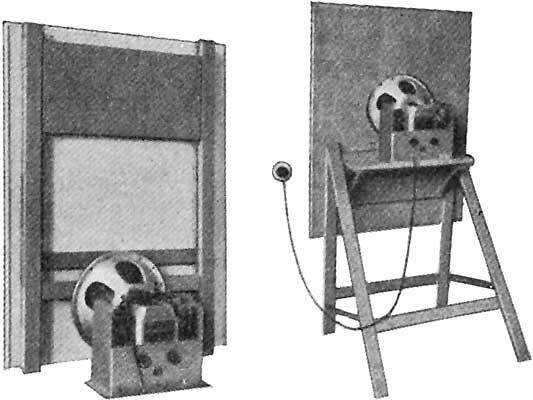 The sound is heard three times by the listener H in the left-hand picture. The right way to position the loudspeaker is depicted on the right (picture source). Also in this loudspeaker set-up the sound is heard three times by the listener H in the left-hand picture. 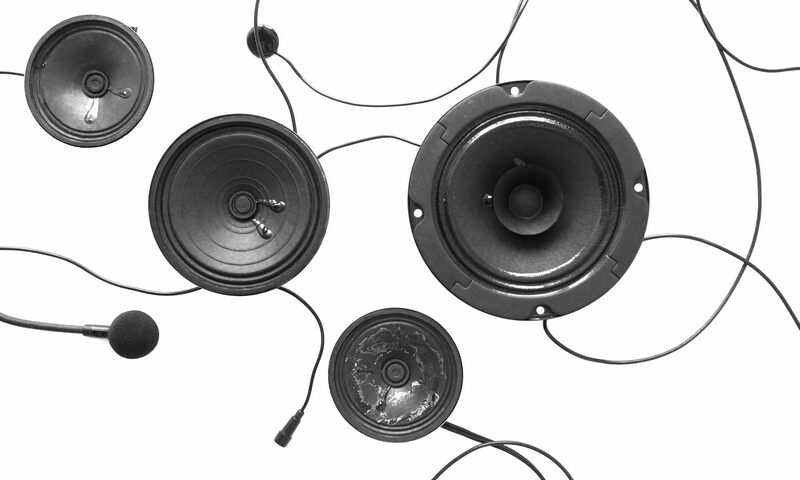 The right way to place the loudspeakers is depicted on the right (picture source). The use of so-called Pilzlautsprecher solves the problems caused by mono-directional loudspeakers (picture source). I asked Ralf if he had a favourite among all those different patents listed on his site. He told me that he finds the Improvement in Magneto-Electric Apparatus by Ernst W. Siemens (US 149797 April 14 1974) very special, since it describes already the modern electrodynamic loudspeaker, which is then “reinvented” again during the 1920s. When reading the patent lists, my eye fell on a patent from December 20, 1924, filed 9 days after the famous Rice and Kellogg patent (DRP 631724). Remarkably, this patent (CH 113262) for a radiophonischer Lautsprecher (radiophonic loudspeaker) was filed by a woman; not surprisingly, the only one on this list. The invention itself is not very spectacular; it is a kind of double moving iron loudspeaker, using two metal membranes. This system would become obsolete as soon as the electrodynamic system as described in the Rice and Kellog patent mentioned above was established as the common way to build loudspeakers. During my research for the book, I did not have time to investigate further, but during the last few days I tried to find out who Maria Schlatter Schrag was. My search has not yet ended, and it will probably take some more time to find out why this patent was filed by a woman. I am afraid, though, the reason might be much more mundane than I was hoping for. As far as I know now, was a servant and a cook, and not the polytechnic university student I was hoping for (Zurich University was open for women already from the 1860s onwards). Her husband, Rudolf Schlatter, was a radio technician though, and it might be he who invented the loudspeaker, and she just filed it for some practical reason. 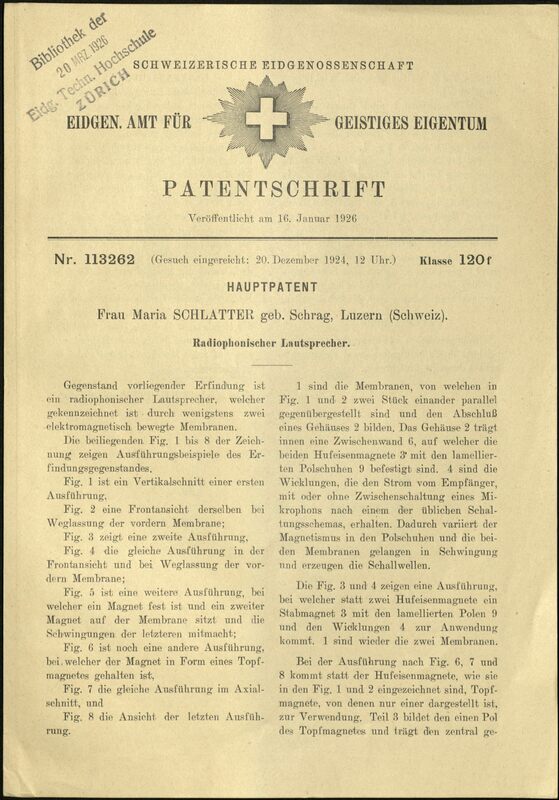 The patent for a radiophonischer Lautsprecher by Maria Schlatter Schrag, 1924.